Nu Klezmer Army brings new life and energy to the traditional music of the yiddish-speaking jews of Eastern Europe. 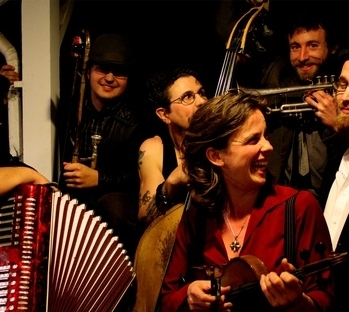 Melding together each player’s diverse musical background, NKA brings forth an undeniably fun incarnation of instrumental, dance oriented, emotionally charged, klezmer music. Equal parts wandering gypsy, pickled punk, cut-rate circus, and drunken rabbi, Nu Klezmer Army stays true to the traditions of learning from one another over bottles of shlivovitz and sharing stories of out travels. We have played everything from the seediest of punk rock dive bars, to ornate historic theaters, brass band and circus festivals (although we are neither a brass band or circus), vegan dinners, city sponsored ground breaking ceremonies, midnight in the mountains around a fire and we are up for just about anything.